I Called Him Morgan is the story of two troubled people, one of whom killed the other. Documentarian Kasper Collin—who previously made My Name Is Albert Ayler, also about a jazz musician—looks at the difficult, abbreviated life of trumpeter Lee Morgan, who was shot dead in the winter of 1972 in New York. It’s not a mystery who pulled the trigger—it was his common-law wife, Helen, who was more than 10 years his senior—but I Called Him Morgan isn’t about solving a crime but, rather, connecting the dots regarding why it happened. Throughout the film, you feel the slow, grim pull of inevitable tragedy. Collin has shaped his film as a dual biography, focusing mostly on Morgan but interweaving Helen More, who grew up in North Carolina, desperate to escape the country. She had good reason: She birthed two children by the time she was 14, going on to marry a 39-year-old man at 17. (She’d only known him for a week.) Helen’s story is told mostly in her own words through a remarkable audio interview she gave to a teacher in February 1996, just a month before she died. I Called Him Morgan is lit up by Helen’s spectral presence, the crackles and imperfections of that long-lost recording intensifying the intimacy and vulnerability of her tale. Meanwhile, Lee’s story is told through interviews with his friends and colleagues, many of whom knew Helen, as well. With both of its central players no longer living, I Called Him Morgan is a twin remembrance, and as such one should take the anecdotes and opinions with a grain of salt. (Even Helen’s memories could be clouded by time and bias.) But Collin and his fellow editors—Hanna Lejonqvist, Eva Hillström and Dino Jonsäter—give these stories a building, melancholy power, as two people’s orbits eventually intersect. Even before Lee and Helen meet, we sense that they’re destined to come together. 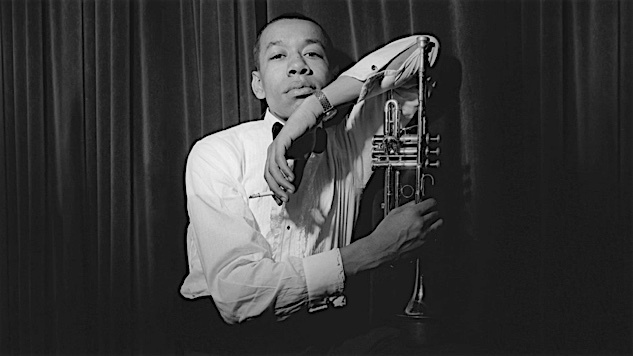 From the mid-1950s until his death at age 33, Lee Morgan was among the premier jazz trumpeters, playing with artists such as John Coltrane, Dizzy Gillespie and Art Blakey, as well as releasing his own heralded work, such as 1963’s The Sidewinder. Born in Philadelphia and revered in New York, where he was integral to that city’s fecund jazz scene, Morgan is described by his friends as immensely talented and somebody who was always on the lookout for the next beautiful girl—in other words, not dissimilar to so many other bright, young musical stars. Also like them, his career trajectory was jeopardized by drug abuse—specifically, heroin, a favorite of jazz artists of the time. Consequently, I Called Him Morgan’s portrait of Morgan can’t help but feel slightly, depressingly familiar: Lee battled racism and addiction, producing incredible music along the way. But if his story has a recognizable arc, Helen’s proves to be a sobering and unpredictable counterpoint. Moving to New York after her husband’s premature death and letting her grandparents raise her kids back home, she sought to remake herself, becoming the inviting hostess with the lively home, cooking scrumptious meals for the people she’d befriend. In the process, Helen created a community of artists and outsiders, although she confesses that underneath that generosity was a steely survivor determined not to repeat the mistakes of the past. And because we only hear her speak as a much older woman, the Helen we meet in I Called Him Morgan is one who’s not just narrating her life but also looking back on it. The documentary is not her confession as much as it is a testimonial. Collin has these two stories running on parallel paths, and despite Lee and Helen’s age difference, we understand why they might fall for one another. As one of the film’s interview subjects explains, Helen needed someone to take care of, and Lee very much needed someone to take care of him. (Helen also served as his de facto manager.) Although I Called Him Morgan never quite comes out and says it, what seems obvious is that Helen was perhaps cursed to have a big heart—or, at the very least, to be someone who craved people. Her relationship with Lee, which began around 1967, seemed to be a stabilizing force for both of them, and she helped him kick drugs. No wonder, then, that the introduction of a new woman into Lee’s sphere proved traumatic to Helen. Feeling betrayed, Helen soon grew tired of being treated so shabbily, which led to Lee’s untimely demise. There’s no salacious gossip in I Called Him Morgan’s treatment of Lee’s final days—his friends, more than 40 years later, still seem shaken by the experience—and there’s also no judgment on Collin’s part. The trumpeter’s death is treated as a terrible shame, but even those closest to Lee admit on camera that, after hating Helen for so long afterward, they found themselves ultimately forgiving her years later. The movie never really questions that change of heart—like much of what we hear in I Called Him Morgan, it’s merely part of the fabric of these people’s lives, just another one of those mysteries of human behavior. Throughout the documentary, Collin gives the film a lush visual palette. (Oscar-nominated Arrival cinematographer Bradford Young is one of I Called Him Morgan’s credited cameramen.) The talking heads’ tales are crosscut with dreamy images—snowy nights in New York, a hypnotically colorful fish tank—that always feel pertinent to what’s being discussed. And then there are the interview subjects and the milieu. Jazz musicians such as Wayne Shorter and Charli Persip talk about their friend with specificity and insight, and Lee Morgan’s music—as well as the music he played in other people’s bands—fills the soundtrack. I Called Him Morgan will be heaven for jazz aficionados, but those who don’t know the difference between bebop and hard bop won’t feel lost. Collin understands that his film is about people, not art, but his deft storytelling—and the endless sadness that comes from his tale—flexes its own nimbleness and beauty.